Yom HaZikaron — Memorial Day, a day of national mourning — began last night with a siren at 8 PM. Yom HaZikaron will end tonight, when the nation will turn in a flash to Yom Ha’Atzmaut — Independence Day, a day of national celebration. I have commented several times on the startlingly abrupt shift in mood, which, while it is somehow emblematic of the Jewish people with the ups and downs of our national life, also seemed — what? — strange. Our nation survives because of these young people — soldiers on active duty and reserve soldiers — who come forward, knowing the risks to their own lives, so that the nation might live. Each mother who sees her child go off to serve understands this painful reality. It is the price to be paid for Israel. And what’s incredible is that most soldiers go willingly and proudly, even knowing. Our nation’s debt to them is beyond measuring. This past week in its Magazine section, the JPost ran an article on “Defenders of the land.” One of these is Ran Bar- Yoshafat, who is now in the reserves. “He carries on him at all times a list of comrades who have died in battle, including when and how they died. “‘At first I thought, well, I’d just remember them all, but now then there were too many,’ he says. The list is up to 20 now. 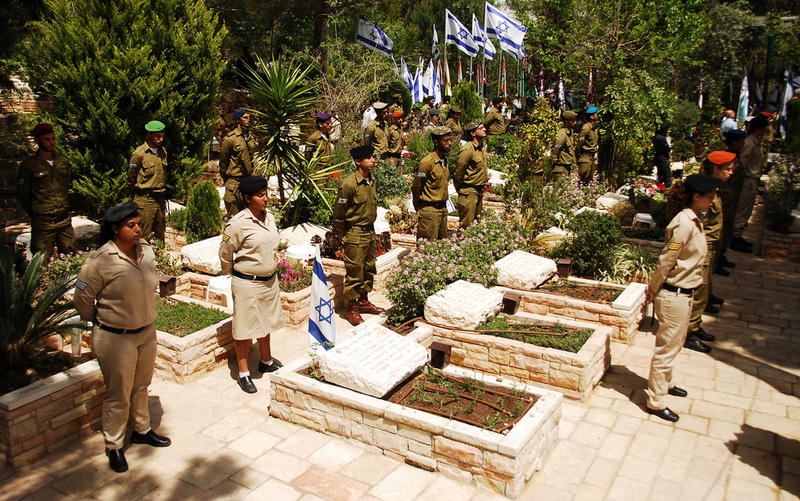 “For Bar-Yoshafat, who considers the IDF ‘an absolute necessity’ and something that ‘teaches more than anything else about life,’ Yom HaZikaron is the holiest day of the year. And so our people go by the millions to the military graves of those who have fallen — to honor them, to remember them, and to mourn them. And then the Israeli people turn to celebration of our nation, which, I suspect, is precisely what those who have given their lives for it would want us to do. Surely their souls rejoice with us, because they made it possible. “So palpable and pervasive is grief on this day that visitors who spend it with us take its memory with them for the rest of their lives. “Back when the state was established, foreigners who cared for it wondered how the minuscule state would survive while under-populated, surrounded by enemies and lacking natural resources. Asking such a question today is an anachronism. Israel’s economy has matured, its currency is solid, its growth rate has been for the better part of a decade among the developed world’s highest, its unemployment and debt-to-GDP rates are among the world’s lowest, and its inventiveness has become the subject of legend. “In the past decade…Israel has become home to the world’s largest Jewish community for the first time since the Second Temple era, and is now well on its way to becoming home to a majority of the Jewish people — for the first time …since the days of Jeremiah. 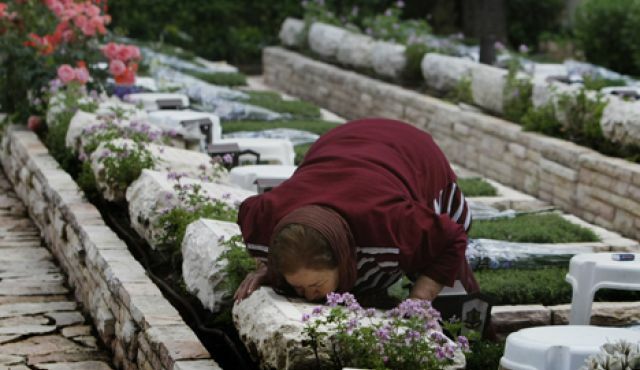 “Culturally, the Jewish state is a fountainhead of creation and exploration… None of this would have happened but for the sacrifice of the fallen. We count now 23,085 who have fallen in defense of Israel. That’s not just IDF forces, but police and other security forces, including those operating before the formal establishment of modern Israel — counting since 1860. I believe those who have died as victims of terror attacks are added to this number. A video here of a soldier, Asael Lubotzky, who didn’t die, but came close. 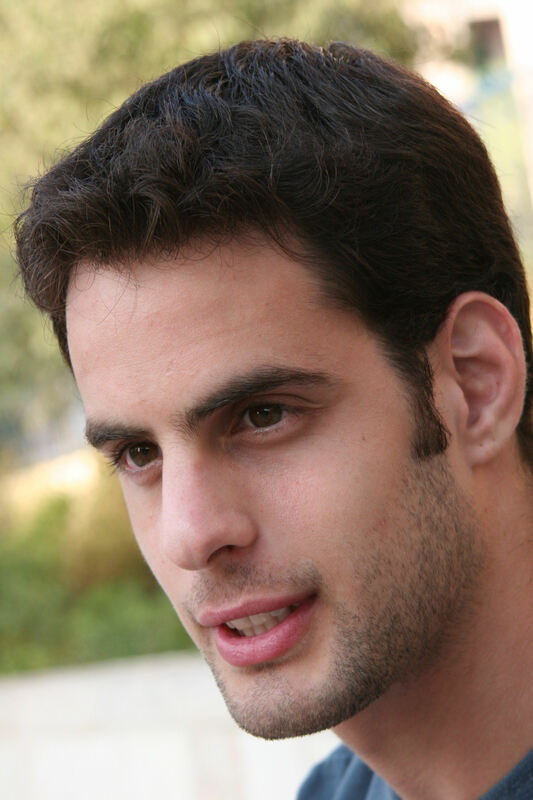 His remarkable spirit tells us a great deal about what Israelis are like. Everyone hears the echo of eternity – even Liberal politicians seeking to deny religious freedom to others. Deeming themselves a greater power over the people than God — is a presumption of all Socialists-Marxists in government. Called pastors belong in the pulpit, not frauds seeking to distort, mock or obscure scripture. To understand the history of the radical Left’s battle against God, read the book, Darwin’s Racists – Yesterday, Today and Tomorrow. For wisdom, guidance, and the way to salvation, read the Bible – then step forward and broadly advance the true Word of God. For YouTube discussion on the dismantling of America: Click here. 2 dead, 23 injured. 10 lost limbs. 2 bombs went off and a 3rd was found. And the authorities THINK it MIGHT be terrorism. Asshats. Soon coming to a town near you! The TOUR – Lars Vilks Mohammad dog on the run! The Roundabout Dog TOUR – ”The Tour” – is an active campaign aimed at creating awareness about the vulnerability of Freedom of Speech in the “new” multicultural world. Using the Swedish artist Lars Vilks’ known seal, The Roundabout Dog (Rondellhunden), as the crucial pivot point, the TOUR will visit seven countries in Europe, from 1 April to 30 September, 2013, beginning in Sweden. The other six countries are Norway, Denmark, Germany, Holland, Austria and Switzerland. The TOUR began in Malmö on March 26th with a visit to the Islamic Center founded by the deceased Qaddafi and still owned by the Libya-based World Islamic Call Society. THE TOUR has more than one purpose. We wish to draw attention to the fact that freedom of expression has increasingly tighter conditions in the easily offended multicultural Europe. Another objective is to generate public interest in Lars Vilks and his art, which we believe – with Lars Vilks vulnerable position as a fatwa-persecuted artist – deserves to be seen and acknowledged by a much wider audience than it is now possible to reach because of the prevailing political correctness in the existing artistic environment. Lars Vilks has faced numerous death threats and a suspected assassination plot since his drawing of the Muslim prophet with the body of a dog which was first published by Swedish regional daily, Nerikes Allehanda, in 2007. FREE SPEECH EUROPE has planned a series of quick-exhibitions for the “Grand Tour” where Lars Vilks will be present introducing his original art work and will speak about his life under siege! Denmark, Germany, Austria and London are actual locations. The initiative to FREE SPEECH EUROPE was taken in the Fall of 2012. The association is non-political and its purpose is to promote freedom of speech by supporting people who are victims of “blacklisting” or other forms of persecution because of their artistic or political expression. Our focus is on Lars Vilks, who, when his Roundabout dog was born in 2007, lost his livelihood; this can hardly surprise anyone. We cooperate with a number of organizations, blogs and individuals with regard to promoting the TOUR and to helping us market the Lars Vilks art package that will help to ensure the economy of the tour. We want to do much more, but our funds are limited. Our heroes Lars Vilks, Kurt Westergaard, Robert Redeker, Flemming Rose, Salman Rushdie, Lars Hedegaard and many others, are persecuted all year round by those who would prefer to see our freedom limited. Sign up for membership here! It is possible to support Free Speech Europe and the tour by buying copies of four beautiful Vilks paintings depicting Muhammed as a dog on a table, as a dog on a bed with a naked lady, on a t-shirt on a lady and his chopped off head in the hand of what looks like an androgynous version of the Goddess of Justice. Source: The Roundabout Dog TOUR’s News team. Pics and other stuff for downloading, free to use in its meaning! If the target had the name Trayvon Martin printed on the hoodie or perhaps an exact likeness of his face then perhaps the department can make a case against the officer. That said; what about Homeland Security ordering “non-traditional threat” targets of pregnant women, old retired men with shot guns and other civilian settings which are to be used in training police officers to shoot their fellow citizens? Should we fire anyone with Homeland Security associated with the purchase of “non-traditional threat” targets on the basis their presence is politically incorrect, just as the Port Canaveral Police Department believes a target of an individual resembling Trayvon Martin is a rather poor choice and shows a lack of common sense? Just wondering. Would anyone be offended if folks started using targets that resembled, let’s say, Janet Napolitano at the local pistol range? Would a team of FBI agents show up at your door to haul you away or would the secret police squad from Homeland Security handle that? 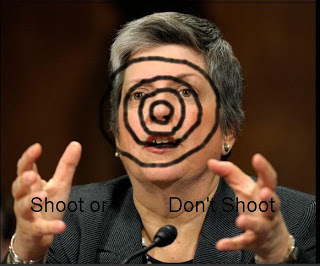 Would anyone really use a target of Janet Napolitano at the pistol range, or substitute some other notable figure? Just putting the thought down in writing will set off alarms in that fancy new information gathering unit out in the desert. Is that a helicopter hovering over my house and would somebody see who’s at the door pounding away? A demonstration against the regime of Mohamed Morsi will take place in London opposite the House of Lords on Saturday 20 April 2013 from 12-3pm. It is an opportunity for people to voice their opposition to the human rights abuses that have become a regular occurrence since the Muslim Brotherhood regime came to power. More information can be found at the website UK Copts where we found out about this demonstration. The demonstration should be an opportunity for Muslims and non-Muslims to come together and signal their opposition to Islamic extremism with a single voice. The Coptic population of Egypt which descends from the Ancient Egyptians was subject to abuse under Mubarak but the situation got dramatically worse with the accession of the Muslim Brotherhood. But with an Islamist regime in power even Muslims could potentially be persecuted if they are not deemed to be pure enough for the Brotherhood. The people of Egypt of whatever faith background deserve to live under the rule of law rather than laws and practices inspired by the inequality of the Sharia. They deserve to live under a system that is both secular and democratic. The anti-sharia community predicted the Muslim Brotherhood would come to power in Egypt on the back of Western interference in North Africa. It also predicted that this would be bad for the people of Egypt, for both Muslims and non-Muslims alike. They were criticised at the time as being alarmist, Islamophobic, or ‘far right’ due to such predictions. They were told by ‘those who know best’ that the Muslim Brotherhood were ‘moderate Islamists’ – a ridiculous act of circumlocution! It was the equivalent of someone in the 1930s saying that there were Moderate Nazis in Germany and as a result there was nothing to be concerned about. At a time when the British and other Western governments are in the process of trying to install an Islamist regime in Syria it is quite appropriate for a demonstration to take place in the British capital. The British Government’s current pro-Islamist policy and its support for the hypocrisy of the Organisation of Islamic Cooperation (OIC) needs to be brought to public attention. The people of Egypt are suffering because the real threat posed by Islamism and groups like the Muslim Brotherhood has been ignored in the West. In fact, if anything Western opinion formers have been bending over backwards to make Islamists sound like progressive, forward looking humanitarians. However, the reality on the ground speaks for itself. Demonstration opposite the House of Lords on Saturday 20 April 2013 from 12-3pm. Every week on Monday morning, the Council and our invited guests weigh in at the Watcher’s Forum with short takes on a major issue of the day. This week’s question: The 10th Anniversary of the Iraq War just passed. Was the Iraq Invasion Worthwhile? The Razor: I’ll admit I was wrong about the Iraq war. I took the politically correct view that Arabs weren’t savages and was proven wrong. That’s overly simplistic. I was wrong about Iraq because we weren’t willing to do two things we did in Germany and Japan after World War 2. 1. We treated the regimes we replaced as losers. 2. We discredited the cultures that lead to militarism. Neither Germany nor Japan had strong democratic roots, so instead we imposed superior cultures on them, particularly the British parliamentary system. In Iraq we were doomed because of the politically correct view that all cultures are equal. Ditto Afghanistan. Sorry, but Arab states are based on corruption, violence and kleptocracy and by refusing to impose a superior culture on them we allowed their culture to flourish. In fact, I would argue that at this time we cannot accomplish any nation building anywhere under our cultural relativist beliefs. The Colossus of Rhodey: Well, let’s see: was Iraq under Saddam Hussein really that much of a threat? Sure, as long as he remained in power he could be a nuisance and a potential menace, but to what degree? The coalition from the first Iraq War had Iraq “boxed in,” so to speak, primarily via the “no-fly zone.” And, yes, Saddam had defied the UN upwards of over fifteen times since the Gulf War’s end in 1991. The US tried to make its case to the UN for military action against Saddam in ’02 and ’03, but Kofi and the gang wouldn’t go for it. So as a result, why does this mean that WE — the US — must do it alone? Why must US forces risk their lives because the weak-kneed, yellow-bellied and milksop UN refuses to act to enforce its own sanctions and edicts? One group of countries that seem especially resistant to democracy-building efforts are the Arab lands. There have been are nine interventions in Arab countries in the past century. In no case did stable democracy follow the military occupation. That’s a crucial distinction. Nation building entails America trying to construct an entire way of life for others. And though building a free and democratic world would be a wondrous thing, experience suggests that for any nation it is a vastly complex project that must come mainly from within. America can serve as an example and an ally. But we cannot reliably reengineer other societies, and we risk enormous resentment when we try. No amount of social or political engineering can produce a paradise in which evil urges will never intrude, and though a more widely free and benign world order would produce fewer monsters, we can hardly arrange that within the week. But if we cannot quickly fix all creation, we can at least minimize the opportunities and maximize the penalties for evil actions–something we have not done for a decade now. Of course, not too soon after, President Bush did a 180 on his above claim regarding Iraq. And, predictably, many — most? — conservatives fell in line behind him. This is understandable, certainly — the need to put up a “united front” — but it’s very intellectually and philosophically dishonest for conservatives. After all, didn’t conservatives flame Bill Clinton for his efforts in Haiti? Somalia? Kosovo? They sure did. US soldiers are there to FIGHT, not to police foreign lands or to engage in “building” democracy. Removing Saddam was a good thing, yes, but consider the long-term consequences. Bookworm Room: I’m reading Paul Fussell’s marvelous The Great War and Modern Memory. It is a reminder of deadly wars, fought for stupid reasons, with disastrous consequences. Iraq wasn’t the first and it won’t be the last. So no, Iraq certainly is not the stable democracy and steadfast ally that we hoped for a decade ago. Acts of terrorism still take place there on a regular basis. But there are no government torture chambers in operation. There is a democracy of a sort, and opportunities for Iraqis that did not exist in 2003. So, while maybe the most imperialist view of what “worth it” (ironically adopted by the Left who opposed the war from practically the beginning), the war ended up improving the human rights situation of millions of Iraqis. And if that doesn’t make the war “worth it” from an American point of view, doesn’t it at least constitute an improvement on what was in place before it began? JoshuaPundit: Sorry, but IMO this is sheer horse manure. It’s what I would expect from Jeffrey Goldberg. Since when do we engage in wars – let alone non-constitutional ones – for things other than our own national interest? If that’s the case, I guess I missed our invasion of Sudan to protect Darfur, or our taking out of Hamas or Iran. And what did we ‘liberate’ in Iraq, exactly? Or accomplish, aside from building a brand new infrastructure and a shiny new Muslim army at the American taxpayer’s expense for a Shi’ite Islamic republic with its laws based on Sharia? Meanwhile we’re out a trillion dollars and over 4,000 lives. We replaced a Sunni dictator with a Shi’ite one (read up on the last ‘elections’) who’s close to Iran and whose power base is militias like the Mahdi Army and Moqtada al-Sadr. Iraq is in the process of becoming an Iranian colony. The Sunnis, including those who we bribed to fight with us in the Awakening movement have been completely marginalized, which is why al-Qaeda in Iraq is a growing force again. Iraq’s Christians were horribly persecuted under our watch, and the majority have fled or are trying to. We empower our real allies in Iraq, the Kurds. We didn’t even ‘liberate’ the oil from the wells Halliburton saved after Saddam torched them. China got that. So what did we ‘liberate’? Things turned out badly because we set things up that way. We didn’t make Syria regret they ever let Jihadis into Iraq. We didn’t put in place a firm military governor to enforce a real occupation for the time it took. We didn’t hang insurgents on either side – Moqtada al-Sadr for instance – when they caused violence and act ruthlessly to suppress it. Instead, we saddled our troops with ridiculous Rules of Engagement. We didn’t empower women particularly, or work to discredit Islamism and because of Bush’s fetish for ‘Arab Democracy’ we rushed the Iraqis into an election they were in no way ready for. Bush was unsuited to be a war president. And Iraq was a huge strategic mistake. We would have done far better to not get embroiled there in the first place unless we were going to use it as a base to take on Iran, who actually was complicit in 9/11. Even the 9/11 Commission’s report mentioned that. I give tremendous credit to Patraeus and Ordiano for allowing us a gracious retreat, but that was what it was. The Noisy Room: I supported President Bush when we invaded Iraq. I still believe it was a terrorist pit that needed cleaning out, however… I said at the time and I still believe that it was the wrong initial target. Iran should have been first on our dance card. We did not deal with the ‘head’ of the snake and now the snake is threatening to devour the world. Furthermore, we did not finish the job in Iraq. We were so concerned with not offending anyone, that we offended everyone. After the death of Saddam Hussein, we should have packed our bags and gone home. Instead, we stayed, training their military and rebuilding their country. Not only was that a financial black hole for us (and still is), it was militarily foolish and pointless. In the end, we are still ‘sort of’ there, but the real winners are Iran, who now basically control Iraq. War should be treated as well, war. You go in fight, kill, break things and leave. You don’t grovel and nation build afterwards. You only preemptively strike a clear and present threat as well. Such as, let’s see… North Korea or Iran, who are threatening to nuke us. But instead, we take the real threats to our country and either talk them to death or try and buy them off, both of which ALWAYS FAIL. 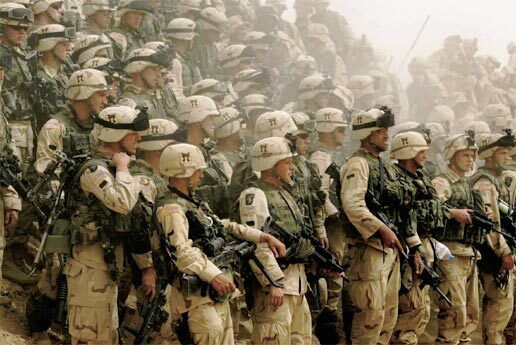 We have lost many, many of our warriors and we still don’t have a clearly defined enemy. We were never allowed to declare actual ‘war.’ The real perpetrators of 9-11 have not been brought to justice. Saudi Arabia, where the majority of the terrorists came from, received no punishment at all. Neither did the backers and primary instigators of the terrorism, Iran (I don’t consider ‘sanctions’ real punishment). The terrorist masterminds who were captured still sit in jail (if you can even call it that as every need and want is met for them) and there is a good chance under the Obama-friendly regime that they will wind up in U.S. courts, rather than military tribunals. This means they could walk, get greatly reduced sentences or wind up in Club Med for wayward Jihadist radicals. Although I feel for the Iraqis and their plight, I now no longer believe invasion of Iraq was worthwhile. Their country is based on a theocratic and militaristic barbarism that is employed throughout the Islamic world. It is a mindset that the West cannot seem to wrap their viewpoint around: “You love Pepsi, we love death.” Our invasion did nothing to make us safer or bring closure to the murders of nearly 3,000 Americans. We spilled our warriors life-blood for little to no gain and ended up doing nothing but entangling ourselves in more pointless conflicts we will not be allowed to win and further bankrupting our nation. The current conflicts in the Middle East are engineered for wealth and power redistribution. I now believe the only way to win in the Middle East is with massive bombing runs and perhaps a judicious nuke or two. Even then it won’t end the threat, just delay the conflict to end all conflicts. The Glittering Eye: Simply stated, no, it was not worthwhile. There were better ways of spending the money, lives and time. Our failure to pacify the country harmed our reputation. A reputation for invincibility is hard to recover once lost. post-war was degenerating so badly. That still doesn’t make it a strategic victory.